The Model 1000 tLift system is simply the easiest Austrian curtain system you will ever install and use. Its design is focused on being self-contained so all that the installer need do is bolt the sections together and lift the system into place. Variable line speed of 0-80 fpm. 24-Volt, Low Voltage Control (LVCS). 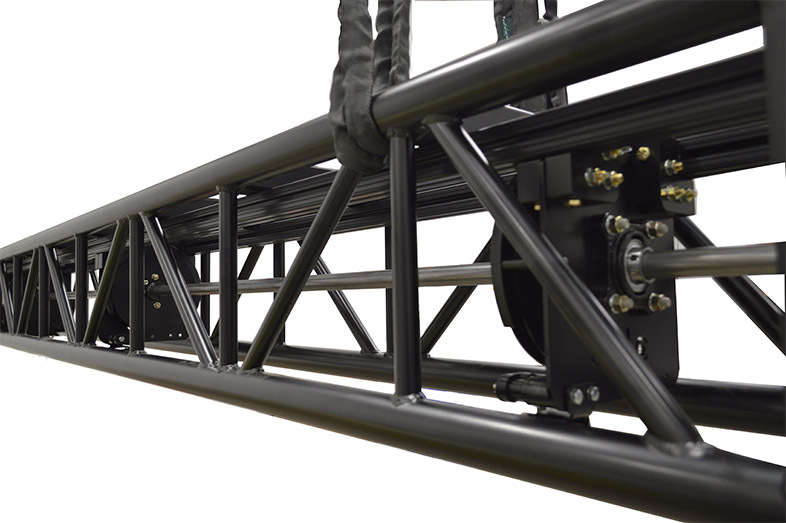 Austrian (Venetian) lift system shall be completely self contained in load rated aluminum box truss with motor control, limitswitches and cable guides mounted directly to the truss package. Motor shall be equipped with an integral power-off frictionbrake and shall attach directly to a right angle gear reducer rated for the lifted load. No belts, pulleys, chains or spider type couplingsshall be used between the motor the gear and the friction brake. Full up and full down positions shall be signaled by integratedrotary limit switches with fully adjustable rotary cams. Limit switches and cams shall be located inside of a removablemetal housing. Main drive shaft shall be of 1” or 1-3/8” solid steel which shall be keyed for spools and end coupling. Supportbearings shall be sealed and greased ball-bearing flange assemblies attached to fully adjustable bearing support brackets. Supportbearing brackets shall be fabricated from formed steel plate, precision cut to match truss cord diameter. Support bearingsshall be placed with a maximum 5’ separation. Fully adjustable cable guides with solid steel ball-bearing wheels shall be used toguide lift cables into the spool grooves. Cable guide brackets shall be fabricated from formed steel plate, precision cut to matchtruss cord diameter. Lift cable shall attach to precision cut steel Yo-Yo spools fabricated to eliminate oblong wrapping of lift cableduring operation. Cable shall wrap in concentric circles about the spool’s central hub to assure smooth operation. No belts, pulleys,chains or spider type couplings shall be used anywhere in the system. Operation shall be start/stop/reverse from any pointof travel. Control voltage shall be 24 VAC or 24 VDC. 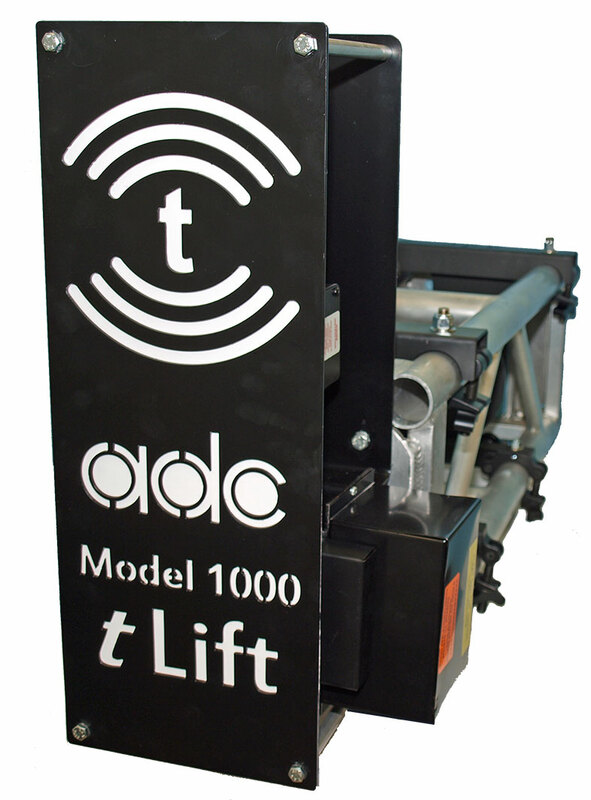 Any number of remote control stations or contacts may be used.System shall be Model 1000 tLift as manufactured by Automatic Devices Company, Allentown, PA.